It's been a while since I've had a Music Monday here on the blog, hasn't it? I promise it hasn't gone by the wayside, I'm just holding off until there's music that I really want to feature. And, yeah, I really want to feature this one. Do you have an all-time favorite album? I honestly can't say that I do. However, I have a pretty good list of favorite albums from my favorite artists and this happens to be one of them. Matt Nathanson is a huge favorite of mine ever since the first time I saw him live several years ago. Admittedly, I think I was just as excited about having seen him as I was about the band that he was opening for. There's something about him, I'm telling you. There's a charisma on stage that draws you into the show, and it's backed up by absolutely solid music. Am I gushing enough now? The song that most of you will likely remember from this album is Come On, Get Higher, which was a pretty successful single. It's a great song, it really is, but there's a couple of songs on this album that I love even more. I have a thing for sad songs, I have to admit that, and for songs that speak to longing for things. I think those are my favorite types of lyrics, and I feel like Matt does that as well as any contemporary artist. I think this album, lyrically, captures me more than any of his other albums - but I still literally love everything he puts out. My favorite songs on this album are definitely Car Crash, Wedding Dress, and Bulletproof Weeks. Beautiful, seriously. Thank you so much for reading! ... And listening, I suppose! 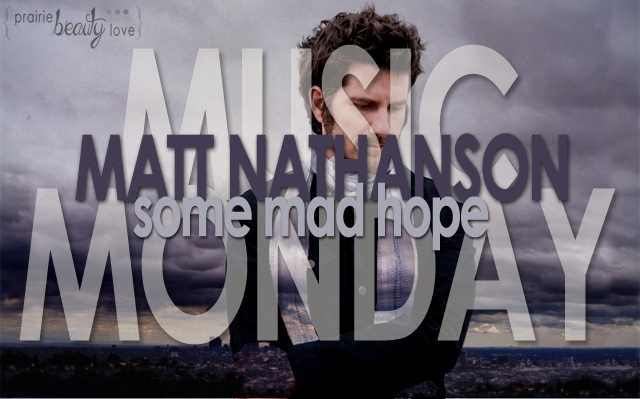 Are you a Matt Nathanson fan? What're your favorite emotional songs or albums?